Any locomotive achieving its centenary is likely to have been well designed and soundly constructed to have survived for 100 years but it must be conceded that there examples of longevity which are simply attributable to good luck. In the case of our Beattie well tank it is a combination of quality combined with fortunate circumstances! As an introduction to our subject a brief history of the designer will not be out of place. Joseph Beattie is reputed to have been a man of strong character with a somewhat forbidding personality and he is purported to have had a temper which was liable to sudden outbursts when this trait from his Irish ancestry came to the surface but his ability as a locomotive engineer was of a very high order and his innate ingenuity produced many design features directed towards improved thermal efficiency and more reliable mechanical performance. Before he joined the South Western Railway he had gained some experience of railway engineering on the Grand Junction Railway with that most eminent engineer, Joseph Locke, the founder of Crewe Works. Beattie was 34 years old when he came south as Assistant Engineer on the L.S.W.R. and he was 46 when he was appointed Locomotive Engineer in July, 1850 to succeed J. V. Gooch. For 21 years he ruled over the South Western's locomotive works at Nine Elms, London, the first 16 years in the old buildings on the west or up side of the main line. These 21 years were very eventful in the development of the L.S.W.R. because the remarkable growth of route mileage and traffic needed additional motive power year after year. At the beginning of Joseph Beattie's regime the South Western had only one main line and that was from Waterloo to Southampton and Dorchester. There were branch lines from Bishopstoke (Eastleigh) to Salisbury and to Gosport and Portsmouth via Fareham. In the London area the branch from Battersea, (Clapham Junction), was open to Windsor and the Hounslow loop had been completed only a few months before his appointment. The Weybridge to Chertsey branch and the Hampton Court branch were newly opened two years before and further out in the country the embryo Portsmouth 'direct' main line had been opened from Woking to Guildford in 1845. Finally, the description of the system is completed by the Farnham branch from Guildford via Ash Junction. And that was all, except the remote Bodmin and Wadebridge Railway in far away Cornwall. In 1847 the London and South Western Railway had acquired this Railway which was destined to play such a significant part in the history of the Beattie well tanks. In the 21 years Joseph Beattie was in charge of the South Western motive power the system expanded in mileage and in stature to a very marked degree. By 1871 the main line to the West of England extended from Basingstoke through Salisbury to Exeter, the 'direct' main line to Portsmouth from Guildford had reached the Brighton line at Havant and the Dorchester main line had been connected to the Great Western Railway and travellers could reach Weymouth from Waterloo. The London suburban service had been developed and railways built to serve Alton, Reading, Leatherhead, Twickenham to Kingston, Shepperton and Virginia Water. Country branches had been constructed to Lymington, Exmouth, Seaton, Chard, Midhurst, Netley, and to Bishops Waltham. Connecting lines were in use between Salisbury and Poole and from Andover to Southampton. 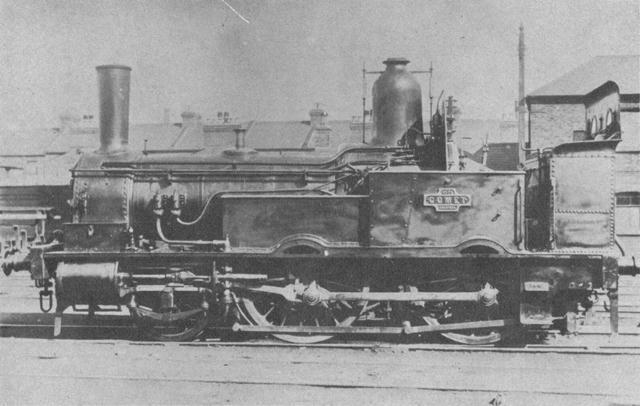 To work the main line passenger and goods services Joseph Beattie designed and built no fewer than 138 2-4-0 tender engines at Nine Elms between 1851 and 1875. He also had 62 goods engines built of the 0-6-0 wheel arrangement and more than 100 tank engines, most of these being of the 2-4-0 design. Joseph Beattie was a man with original ideas. He was the first engineer on a major British railway to abandon the use of single driving wheel express locomotives. He was one of the first engineers to introduce tank engines for suburban work and to reduce the practice of tender first working which had caused so many accidents when enginemen overran signals at danger. His originality extended into the mechanical field. Between 1853 and 1855 he developed a successful coal burning firebox for his engines thereby saving fuel costs. He also designed and applied boiler feed water heating using exhaust steam to further increase efficiency. He dispensed with the common practice of having the cylinders between the locomotive frames and kept the centre line of boilers as low as practicable. The improved riding characteristics of his engines were enhanced by additional steadying bearings to the leading axle. On a number of the Beattie designs the springs controlling the floating axle boxes were mounted directly on the lower slide bars and this feature can be seen on our well tank. Joseph Beattie died in October, 1871 of diphtheria. He was 67 years of age and was succeeded by his son William George as Mechanical Engineer. As a locomotive designer he must rank as one of the great men of the Victorian era. His work at Nine Elms gave the LSWR one of the finest studs of locomotives possessed by any Company at that time. His contribution to mechanical engineering in general and to locomotive engineering in particular was recognised in his lifetime and it is fitting that we should honour the designer when commemorating the centenary of his engine at Quainton in 1974. The text in this Quainton Railway Society publication was written in 1974 and so does not reflect events in the 40+ years since publication. The text and photographs are repeated verbatim from the original publication, with only a few minor grammar changes but some clarifying notes are added as deemed necessary. The photos from the original publication are provided as scans in this internet version of this long out of print publication.